A group of Pakistanis toured Copenhagen and surroundings in February to have a closer look at the Danish democracy and the principles it is based upon. “Truly successful” was the feedback from the group on the visit which Danida Fellowship Centre was co-organizing. How did the Danish democracy evolve? How does Parliament work in Denmark? What measures has Denmark taken to ensure public accountability and transparency? What role does civil society and the media play in Danish democracy? And what role can youth play? These and many other questions were on the minds of the delegation of six members of the Youth Parliament Pakistan, and two members of the National Assembly of Pakistan, when they visited Denmark in February this year. For four days they looked at the Danish democratic model and institutions on the study tour which was organized in a collaboration between the Danish Embassy in Pakistan, the Pakistan Institute for Legislative Development and Transparency (PILDAT) and the Danida Fellowship Centre (DFC). Over the course of the four days, participants were introduced to the Danish political and electoral system and had the chance to meet with representatives from the different levels of Danish democracy. They met with members of parliament and chairs of parliamentary committees during a one day visit to the Parliament, and they had the chance to meet the mayor and members of the city council of Hvidovre Municipality. The members of the delegation were also able to debate with several civil society and pressure group representatives, including a journalist from the Danish Centre for Gender, Equality and Diversity and representatives from the Danish Youth Council, the Danish Institute of Parties and Democracy, and Local Government Denmark. 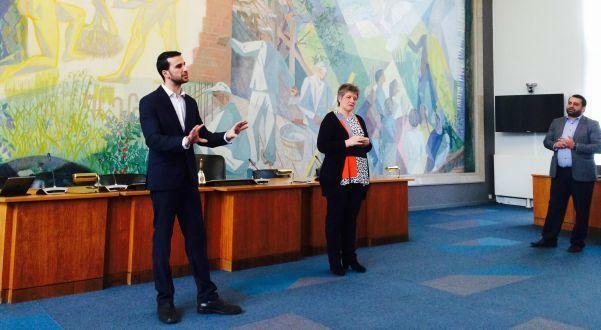 Furthermore, the delegation had the chance to interact with teachers and students at Engstrandskolen and discuss the Danish education system and the participation of youth in politics. Delegates wanted to understand how Denmark tackles multi-culturalism and what initiatives are taken to guarantee participation and equal rights for minorities and vulnerable groups. The Ministry of Children, Gender Equality, Integration and Social Affairs and The Council of Ethnic Minorities met with the delegates and introduced them to initiatives to foster the principles of anti-discrimination and equal treatment in Danish society. The delegation also met with Kashif Ahmad of the new political party “Nationalpartiet”, formed by three Pakistani brothers with the vision to ‘foster a society, where Danish values of respect, tolerance and peaceful co-existence are in focus’. The study tour contributed to foster dialogue in many ways. One of the hot topics during the tour was freedom of speech and what limitation should or should not be imposed on it. The delegates had frank and good discussions on this with the chairman of the Foreign Affairs Committee and former Minister of Foreign Affairs, Mr Per Stig Møller, and journalist Suzanne Moll from the Danish Centre for Gender, Equality and Diversity. The dialogue continued during discussions with Danish youths. From each dialogue, all sides went away with a little more understanding of each other – and with something new to think about. One of the highlights of the tour for the young Youth Parliament Pakistan members was meeting with some of the party youth wings and youth from the UngiVerden network, a network of youth trying to influence the Danish political agenda. ‘Meeting with the Danish youth taught me a lot’, one member of the Youth Parliament Pakistan noted. ‘We had stereotypes in mind about their attitudes and how they would treat us, and we were happy to experience the good treatment and their mind set of reaching out,” another member said. The group was surprised to see how similar the views of the Danes are to those of Pakistani youth. The delegation returned to Pakistan after an intensive four days, bringing back new ideas and inspiration and leaving behind food for thought for those they had interacted with. ‘Everyone we have met, we have learned from and we have experienced new dimensions of the people of Denmark’ concluded one participant. ‘We have done many visits and this is one among few that can be regarded as truly successful’ said President of PILDAT, Mr. Ahmed Bilal Mehboob.